NEIL GAIMAN’S American Gods is one of my favourite novels of recent years and I look forward to seeing the TV show based on it. However, I have to say the first issue of this comic version left me A BIT COLD. P. Craig Russell’s adaptation of Gaiman’s tale of ancient and modern gods clashing in the United States felt…CLUNKY. There’s a lot of Gaiman’s text that’s been jammed into every panel, making the comic feel very word-heavy with the pictures thrown in as an afterthought. Speaking of the art, the main story features Hampton’s art over Russell’s layouts and it’s…well, not the BEST work I’ve ever seen those two do. The back-up story by Russell and Lovern Kindzierski is much better, as Russell is more hands-on with the pencils. Don’t get me wrong: any comic with Neil Gaiman as the source material is going to be a joy to read. I don’t know…I guess I expected SO MUCH MORE from this comic – high expectations will do that to you. Maybe the series will pick up with issue two – I’ll certainly pick it up. 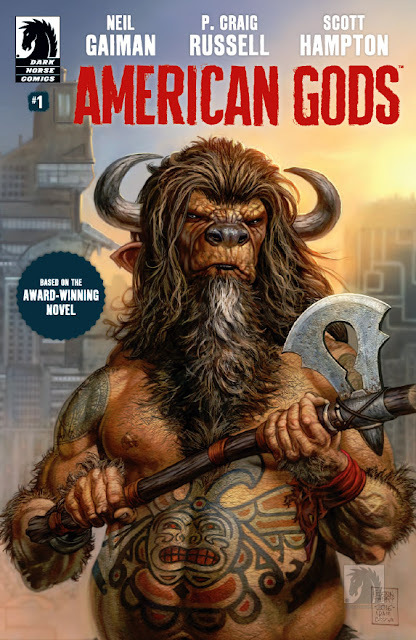 With that said, for those who haven’t read American Gods the novel, then this comic version could entice them to check it out. American Gods #1 is published by Dark Horse and retails for US$3.99. It goes on sale March 15.